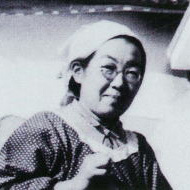 Nagase Kiyoko (1906-1995) Born in Okayama, Nagase was first inspired to write poems by Ueda Bin’s translations of European poems, published in 1905 under the title Kaichô-on. Married at eighteen, she published her first book of poems, Grendel no Haha (Grendel’s Mother), in 1930. The title poem is based on Beowulf, which she read in English in high school. At forty she took up farming. In 1963 she began work for the World Federation. In 1982 she became president of the Society of Okayama Poets. In 1987, at age eighty-one, she published Akegata ni kuru hito yo (You Who Come at Daybreak), which won a prize. The last two poems of this selection are taken from it.